The fourslide does this action quickly and repeatedly, time and again, producing a large quantity of identical products in a short period of time. 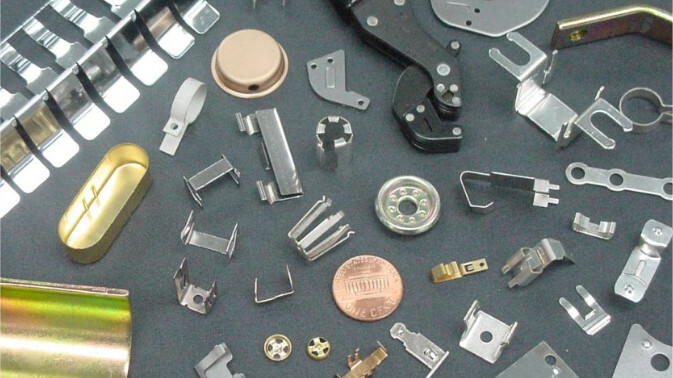 Fourslide Stampings – Talan Products, Inc.
Fourslide machines are economically beneficial for manufacturing intricate parts like metal springs, wire forms, and stampings from metal strips or wires. Some common metallic materials that undergo fourslide stamping are aluminum, bronze, steel, cropper and many more. Fourslide stamping is particularly advantageous for those applications that cannot be accomplished on a regular press without additional secondary processes can be easily made with fourslide machines. Fourslide machines have several beneficial features over other metal stamping processes including a high level of accuracy, repeated results, and a reduced cost in tooling fees. Often used to form electronic stampings, additional applications of fourslide stampings include: in the automotive industry, for use as brake flanges, engine bases, flywheel shrouds and more; and in industrial manufacturing, for parts and components such as gear and sprocket blanks, backing rings, balance clamps and conveyor flights. In a simplified explanation, a fourslide stamping press is the same as a horizontal stamping press with the addition of cams. In addition to cams, the basic design consists of shafts, an electric motor, a die, a press and the sliding tools. The four sliding tools achieve motion as a result of the shafts, which are connected by means of bevel gears to the electric motor. In the fourslide stamping process, there are four sliding tools coming each from their own direction at the metal blank, typically a form of flat sheet metal, in order to bend the metal around a vertical mandrel and thus into a complex shape. A timed mechanism known as a cam is used in order to regular the movement of the sliding tools. The cams are connected to the shafts for optimum control of the sliding tools’ motion. As a result, fourslide stamping is able to incorporate the vertical movement provided by the punch with horizontal movement coming either simultaneously or successively from a number of directions from the sliding tools. Thus, the fourslide stamping more accurately is a reflection of the type of machine used to perform stamping, versus the actual process which could be one of a number of methods including transfer or progressive stamping. Fourslide Stampings Fourslide stamping refers to a particular stamping process that is used to produce complex stamped parts requiring a bend greater than 90°. 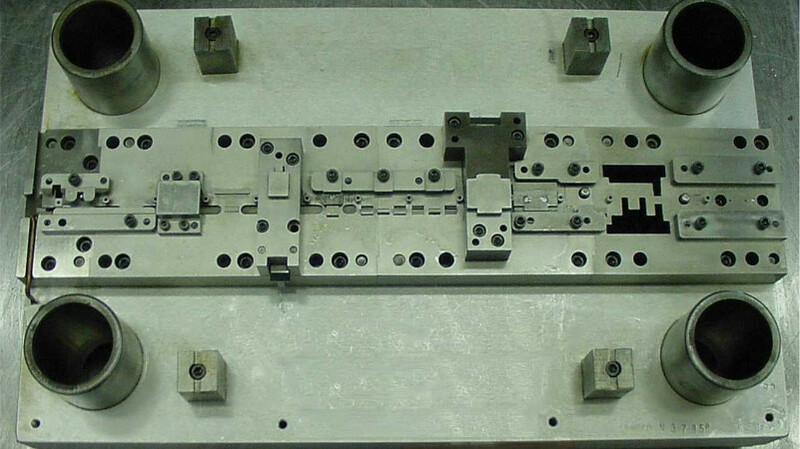 A fourslide is a mechanism that guides a forming tool into the correct position.